Entertaining kids is a full time job. 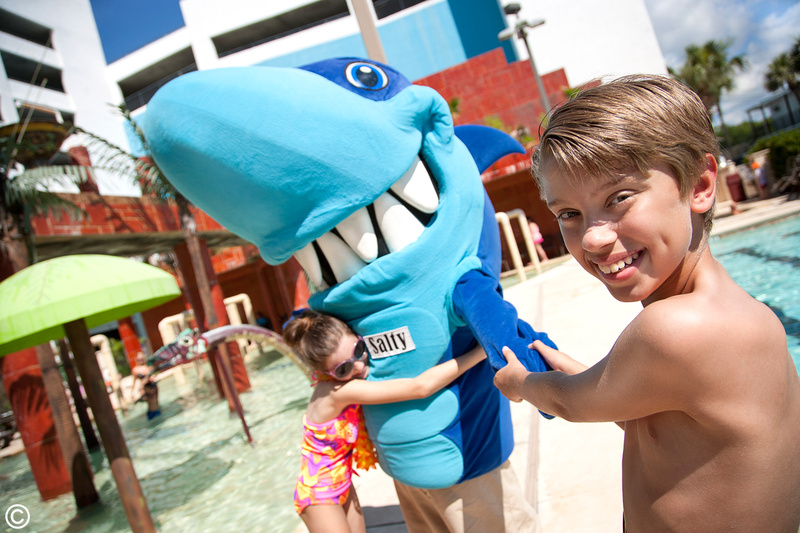 Vacation is no exception for finding fun activities for children to enjoy. Landmark Resort has a variety of children's amenities available so that you may enjoy some down time while they enjoy activities within your sight. The H2Oasis water park is a highlight for every child's imagination as they play in the various sprinklers including: waterfalls, barrel bucket dumps, rain tree umbrellas and bar jet tunnels. The H2Oasis is located adjacent to lounge chairs which allow you to soak up some sun with your kids frolicking about nearby. The lap pool is located is the same area which allows for your workout while being able to oversee your children nearby. The indoor pools, outdoor pools and lazy rivers are huge hits with everyone. The oceanfront pool allows for an ocean breeze and the lazy river ingredients are an inner tube, and a relaxed attitude. The children enjoy floating along with the current and may spend hours tuckering themselves out. The heated indoor pools are perfect for post summer fun and rare rainy days. The lazy river at the indoor pool complex becomes enclosed during the winter months so that your family may enjoy it year round. Kids also love the kiddie play pool featuring a waterfall for a splashing fun time! During the summer months, Landmark lines up a variety of activities like arts and crafts, sports, contests and poolside parties with a live DJ and more. Every day of the week is a new adventure to be had during the summer at Landmark. The proximity to the beach makes it easy to round up children for morning time seashell and shark tooth hunts. By afternoon there are sports competitions and crafts to create and keep as souvenirs. One of the amenities that makes Landmark stand out above the other resorts along the coast is their exclusive mini golf course free for guests. This is an ideal family activity for any time of day. Friendly competition among the family helps create lasting memories and you don't need to travel outside your resort to make them. Landmark lines up the amenities and has everything you need to create the ideal vacation. With something for everyone, you will be the hero that has planned and executed the ideal vacation. Room is great. Staff is great. Location is great. My family and I are having a blast! Scott B. Awesome pools and lots of thing keep the kids busy. Angel S.
Amazing pools and easy beach access was the icing on the cake! Kim K.
I highly recommend this place! Erica L.
My wife and I absolutely LOVE this place. Bill B. This is definitely our favorite home away from home. Amy L.